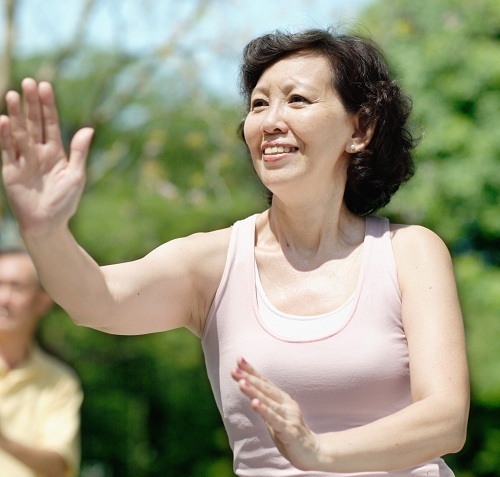 Home » General Health » Tai Chi Reduces Inflammation: Can It Prevent Cancer, Stroke & Heart Disease? Let’s face it; we’re all aging. We all experience this inevitable part of life every day through common ailments such as stress, insomnia, and joint pain. But what if I told you there was something you could do to treat all of them at once…and maybe even prevent cancer, stroke, and heart disease as well? And it’s the Chinese who have the answer. Tai chi has already been proven to provide protection against many physical—and mental—ailments that threaten the livelihood of aging individuals. Now there’s more. Tai chi is an ancient Chinese practice that was originally intended as a martial art. It’s now used as a slow and graceful type of exercise that emphasizes meditative movement. Basically, tai chi consists of a series of movements and poses that flow into each other, accompanied by the all-important controlled deep breathing. Because it’s slow and low-impact, tai chi is considered a safe form of exercise for people of varying levels of fitness at all ages. This is a big reason it’s popular amongst the senior crowd. Now a recent study has shown that tai chi can reduce inflammation in the body by treating insomnia! Maybe inflammation doesn’t sound like a big deal to you, but this is an important development, because inflammation can lead to heart disease, stroke, certain cancers, and other problems. And stress, such as that caused by a lack of sleep, is a major contributor to inflammation. The randomized, control study published in Biological Psychiatry found that tai chi worked just as well as cognitive behavioral therapy—a form of psychotherapy aimed at changing thought and behavior patterns—to improve sleep and relieve inflammation. Subjects who participated in tai chi experienced reductions in inflammation at the cellular level and a closure of inflammatory signaling pathways. These results were maintained throughout a 16-month follow-up period. Participants also showed improved sleep patterns and much lower stress levels. Qi: An energy force that is believed to flow through the body. Tai chi is said to promote the qi and ensure it flows properly. Yin and yang: Elements in opposition in the universe need to be kept in harmony. Tai chi is believed to help keep them balanced. You can learn how to perform tai chi by finding an organization in your community. Visit the group and talk to the instructor about how you can get involved. Performing tai chi for about an hour or two for three days each week will likely produce beneficial results in a multitude of areas, including any insomnia you’re experiencing and possibly the resulting stress and inflammation, which are triggers for much more serious diseases. “The Health Benefits of Tai Chi,” Harvard Health Publications web site, May 1, 2009; http://www.health.harvard.edu/staying-healthy/the-health-benefits-of-tai-chi. Mayo Clinic staff, “Tai chi: A gentle way to fight stress,” http://www.mayoclinic.org/healthy-lifestyle/stress-management/in-depth/tai-chi/art-20045184; last accessed Nov. 11, 2015. “Better sleep and tai chi reduce inflammation and promote health,” ScienceDaily web site, November 5, 2015; http://www.sciencedaily.com/releases/2015/11/151105103039.htm.